The central hall feels fresh with its turquoise walls. Copyright David Parry. 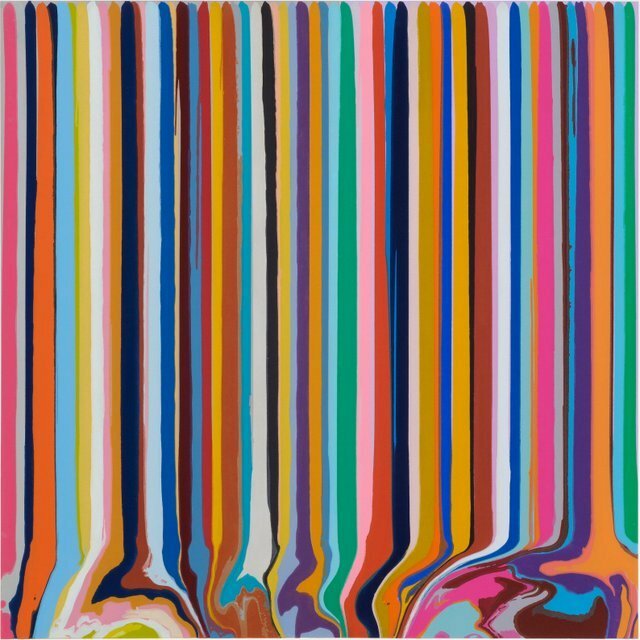 Ian Davenport's stripy painting fits in with the colourful theme of this year's exhibition. Courtesy Ian Davenport and Alan Cristea Gallery. The adjacent room to the central hall features baby blue walls that contrast with the darker works within it. Copyright David Parry. 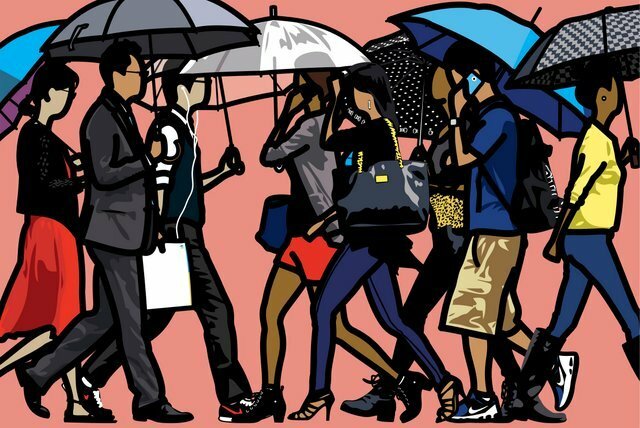 Julian Opie is back with more of his signature walking figures. Courtesy Julian Opie and Alan Cristea Gallery. 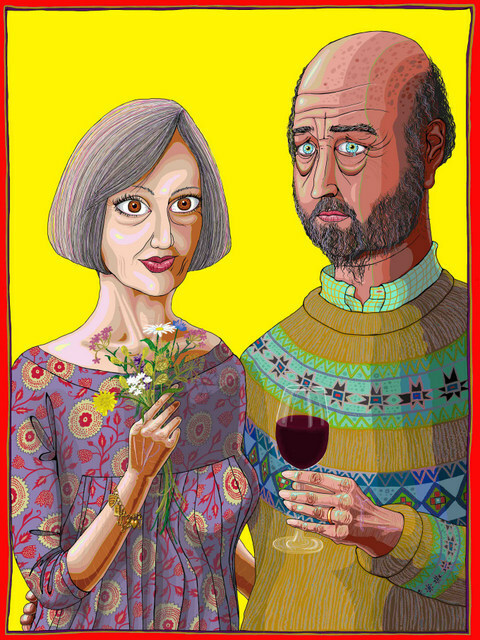 Grayson Perry presents the couple from his art installation / house in Essex. Courtesy Grayson Perry and Victoria Miro. 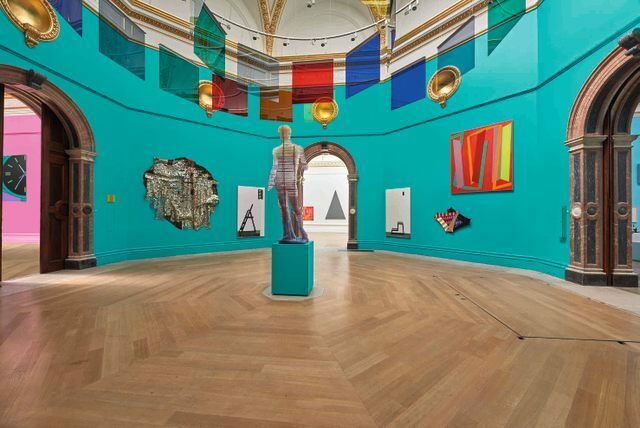 The Royal Academy's Summer Exhibition falls halfway between an art fair and a curated exhibition. 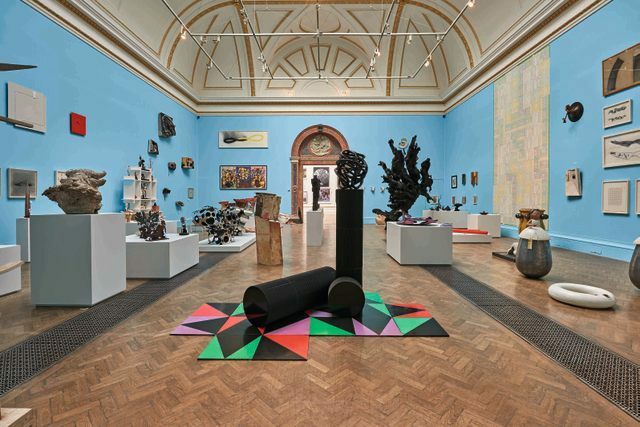 It's ultimately about selling work but the RA makes a great effort to make it accessible for people who just want to have a browse and see great art — including a mixture of established Royal Academicians and emerging artists. This is a tough task considering it's been running annually for 247 years! It’s been steadily getting better over the last few years and we thought last year’s was the best ever, so can this year possibly top it? The 2015 edition opens quite spectacularly with Conrad Shawcross’s angular sculpture dominating the outside courtyard and visitors having to ascend Jim Lambie’s psychedelic makeover of the grand staircase to enter the exhibition. The colourful theme continues inside. The opening three rooms and their pink, turquoise and blue walls keep the show feeling fresh and dynamic, though it’s a shame these coloured walls aren’t in all of the galleries. The architecture room is, as always, brilliant with a great chess set by Karl Singporewala where modern London skyscrapers face off against our historic buildings, and a design for a Mexico airport which looks like a giant creature sprawling across the tarmac. All eyes will tend to focus on sculptures that are placed in the middle of most rooms and some are excellent, including David Nash’s mini tower made of tree bark and a captivating sculpture by Tim Shaw of a man on fire, cast completely in black. Despite there being over 1,100 works in this show, it does feel spacious and very rarely are pieces too closely packed together or hung too high to see — a failing of previous editions of the Summer Exhibition. This is yet again another excellent year for the Summer Exhibition. It’s colourful and inviting, and the Royal Academy should be congratulated on meeting the high benchmark set by last year’s show. The 2015 Summer Exhibition is on at the Royal Academy of Arts 8 June-16 August. Tickets are £12, concessions available. Also on at the Royal Academy are the figurative drawings of Eileen Cooper and the RA has also played a role in the new clock installation at St. Pancras. For more major art happenings in June see our top 10 exhibitions for the month, and the nearby and excellent Fiona Tan exhibition.